Each year SPE recognises individuals who have gone the extra mile by nominating them for an SPE Award. People can be nominated in two categories – those who have supported SPE activities in an outstanding manner – and those who have to displayed technical excellence in their particular field. Locally we recognise individuals who have gone “above and beyond” in their support for our SPE Aberdeen Section with local Section Awards. Those who have gone further and made an exceptional contribution to SPE locally and regionally might be nominated for an SPE Regional Award. Technical contribution and excellence in their professional area – spanning reservoir; formation evaluation; drilling; completions; HSE; management; projects; production and sustainability. 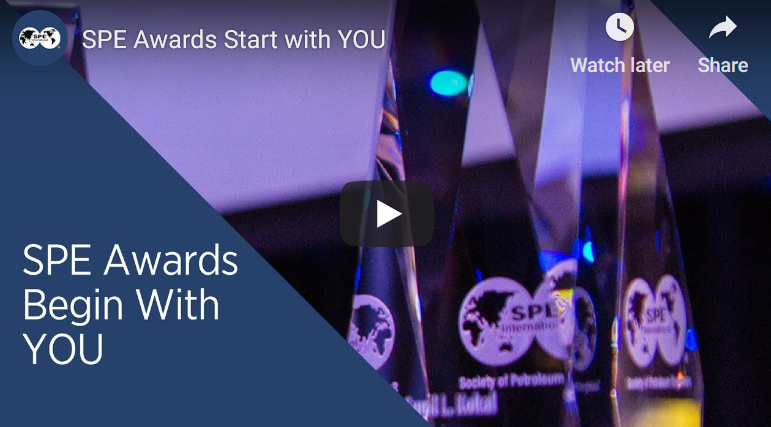 If you know someone who you think should be recognised in some way, please send a short e-mail to aberdeen.chair@spe-uk.org – including their name / position / company affiliation / e-mail address and a few lines describing why you think they should receive an award. We’ll take it from there – identifying the appropriate award category, orchestrating the support paperwork and submitting the nomination papers. If you like to discuss someone’s suitability please e-mail Ian Phillips at aberdeen.chair@spe-uk.org and we can arrange to speak.